We’re currently sitting here, wondering which day Jesus opened his Easter Eggs and how long we have to wait. So what better time to put the band back together and discuss our favourite second comings in film. We have risen! Love and Death. They go together like steak and chips, caviar and champagne. Chas and Dave. In director Martin Brest’s hands, however, death appears to have been watching a lot of Lifestyles Of The Rich And Famous and in the case of Meet Joe Black, itself a remake of Death Takes A Holiday, the concept of resurrection turns out to be a fairly selfish one, as the Grim Reaper swaps his black robes and scythe for a grey suit and a six pack. To be fair, if you were a supernatural entity intent on taking a long weekend off, there are certainly worse places to choose than the multiple mansions of Anthony Hopkins’s rich communications mogul William Parrish and worse bodies to take than Brad Pitt’s. 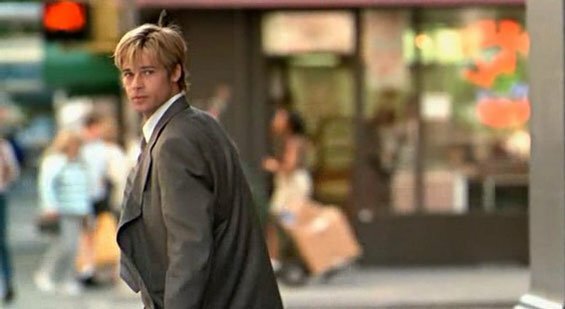 Pitt’s character used to be a cute guy, swanning about in coffee shops, charming pretty young strangers, until a badly judged game of ‘last look’ sees him lock eyes with a car, which twats him into the air like a discarded Stretch Armstrong, only to be double twatted by a van. Suffice to say, he ends up a roadside pancake, leaving Death with the perfect opportunity to try on his sculpted physique, if not his charming demeanour. Given the moniker of Joe Black, he begins to shadow Parrish’s every move, in an attempt to get to grips with life’s true meaning, while eating expensive food, riding in helicopters, and staying in a penthouse. You can’t blame him, I suppose. If Jesus Christ had lived in Manhattan, chances are he would have had more restaurant options for the last supper, and in Pitt’s hands, the film turns out to be a fairly sweet affair. But it does spread itself a little thin for nearly 3 hours in running time, focusing on a romantic interplay between Joe and Parrish’s daughter, Susan, played by Claire Forlani. Their courtship and affair seems to be built entirely on making wide Bambi eyes at each other, and more smiling than a toothpaste commercial, while the love making scene could readily be described as two confused people attempting to rummage for small change in the folds of a couch, while naked. In many ways, the film reflects our need to believe that death is not the end, and that love is the only constant worth living, and dying, for. It’s a sweet notion, but it sits oddly when you place the story into the context of life in America under, say, Trump’s presidency. One wonders what Joe would have made of a life on the poverty line? In the end, it seems, even Death himself chases a dollar. 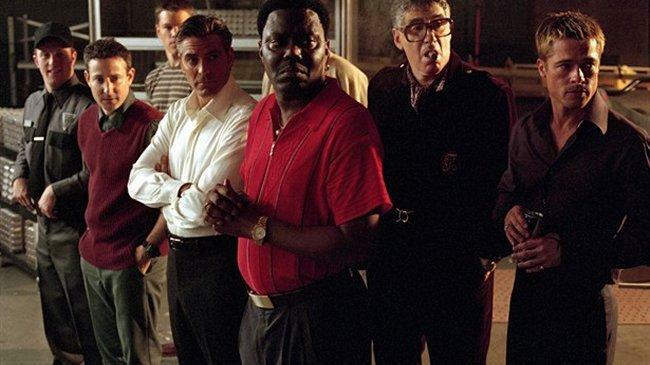 Although not a big fan of remakes, I am a fan of Steven Soderbergh’s 2001 remake of Ocean’s Eleven. Even though the original had Rat Pack favourites such as Frank Sinatra, Dean Martin and Sammy Davis, Jr., it was quite dull and had one of the most abrupt endings in film history. The 2001 remake, on the other hand, exudes confidence and a sense of glamour from its impressive ensemble cast and the bright lights of modern-day Las Vegas. The natural camaraderie between Danny (George Clooney) and his gang makes the film fun to watch, highlighting a brotherhood that makes Ocean’s Eleven more than your average heist film. As for the heist itself, it is still one of the smartest, classiest robberies you will see in cinema. Nevermind second chances, perhaps the adage of ‘third time’s a charm’ is more apposite. In stark contrast to the much-maligned Planet of the Apes (2001) as “re-imagined” by Tim Burton, The Planet of the Apes (2011 – 2017) series has evolved into one of the finest modern film trilogies. Going back to the origins and making the new trilogy altogether more relatable to a modern audience was a masterstroke. After all, a lot’s changed since 1968 where the world was under the constant threat of a nuclear war. No…wait! Burton’s film blamed the uprising on err…it’s difficult to say: unfinished monkey business? Something about Ape Lincoln? (Answers below in the comments please) However, Rise sees the escalation of ape intelligence as a result of animal testing whilst the human’s succumb to ‘simian flu’. Subverting expectations and framing Caesar (a sublime Andy Serkis) as the protagonist presented the conflict between peaceful protests and aggressive negotiation in Dawn of the Planet of the Apes. Arch nemesis Koba is a truly memorable and vicious villain and with Toby Kebbell on the performance capture duties, this deserves to have been the film series which finally recognised performance capture as award-worthy acting. Resisting the urge to club you over the head with the connections to the original series of films (I’m looking at you, Rogue One), as the particularly poignant final installment in War for the Planet of the Apes (2107) draws to a close, Caesar’s empire is well established, hinting at the future that could be. 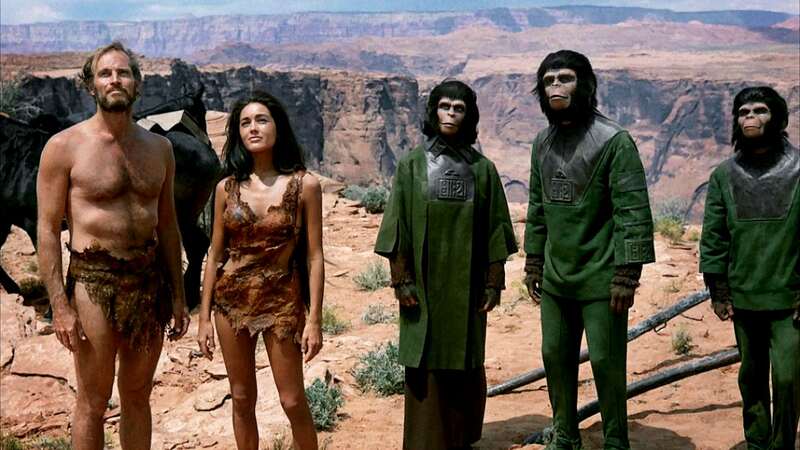 The mute human female Nova lives to perhaps someday become Charlton Heston’s “seen and not heard” arm candy of the ’68 film, whilst Caesar’s surviving son Cornelius will maybe become the archaeologist and historian who eventually fights the human’s corner. But it doesn’t have to. The Planet of the Apes Trilogy stands bipedally, straight and proud, next to The Dark Knight Trilogy. With all that being said, perhaps the next time a beloved franchise is touted for a resurrection, us film fans can reserve judgement until we’ve seen the final product. As we’ve seen, sometimes, things are better on the second time around. Unless they touch Big Trouble in Little China. Then, we riot! Which film resurrections did you think were worth the wait? Let us know in the comments below.